"...one large book in English concerning various subjects composed in the form of verse." 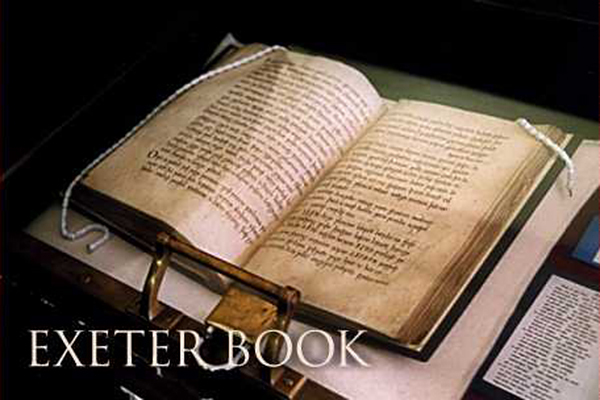 The Exeter Book resides in a locked vault in the library of Exeter Cathedral, safe there after the vicissitudes of a thousand years, although not unscathed. At one time, the front cover had been used as a cutting board and beer mat; leaves are missing and fourteen pages at the back have been burnt. Written in a single hand, it is one of four manuscripts, dating from the second half of the tenth century, that preserve virtually all the poetry in Old English that has survived, including such important elegiac poems as The Seafarer, Deor, The Wanderer, The Wife's Lament, and Widsith. 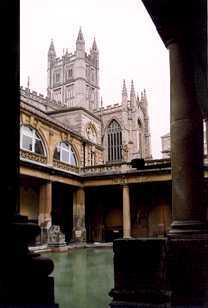 One of the most poignant is The Ruin, thought to be an elegy on the ruined town of Aquae Sulis (Bath), which, like all Roman ruins, was imagined by the Anglo-Saxons to have been built by Giants before them. The perception of loss and sense of regret over the transience of things is made all the more evident by the survival of the poem, itself. And, as the anonymous poet meditates on the ruined stones of Bath and reflects on a distant past, so does the reader, twice over. Well-wrought this wall: Wierds [Fate] broke it. The Romans had been gone from Britain for four centuries and more when this poem was written. It would be another three hundred years before there again would be such work in stone. Even to Nennius, writing about AD 800, the site was one of the wonders of Britain, "surrounded by a wall, made of brick and stone, and men may go there to bathe at any time, and every man can have the kind of bath he likes. If he wants, it will be a cold bath; and if he wants a hot bath, it will be hot."